Bamboo fencing design is so varied it fits in well, not only with Japanese garden landscape designs, but with many garden and yard plans and projects. All gardens need some kind of boundary fence and larger gardens also benefit from dividers that enhance different uses within a garden. 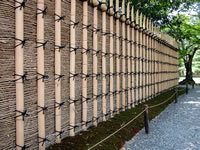 Bamboo fencing is affordable, and provides decorative options to a fence that may otherwise be quite boring. As a natural material, they are also unique, attractive, and durable in the same way that hardwood fences are. They offer privacy screening from neighbours, can serve to cast some light shade in warmer climates, and act as a windbreak in more exposed locations and climates. One of the easiest ways to install a bamboo fence is by using readymade fencing panels that are made completely ready to install. 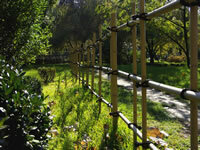 Think about the purpose of a bamboo fence for your garden or yard. Do you need privacy or decoration? Will it be for containing your garden or for a design aspect? To get some inspiration for your property have a look through advertisements of bamboo fencing for sale. Images alongside the ads will usually show the fence on location and/or within a garden or yard design. Gardening contractors and installation specialists will normally have photos of past projects they have worked on and should be able to show you pictures to give you some more ideas. Have a look through some fencing design books, there are a few available that are quite comprehensive and show designs that have been used through centuries in Asian countries. Looking through books on fencing design is really important to get a wide range of ideas if you are planning on designing and building your own fence. You will need to investigate your options for sourcing materials, decide on the size of bamboo poles you will need for your design and how many, including a bit over for wastage. Don't forget to consider what treatment to use. Bamboo fencing is natural and will require the same protection from the elements as you would expect to give hard wood fencing. The supplier of your poles should advise you on treatment for your region and climate, including any potential need for insect infestation prevention treatment. I have a few books on bamboo fencing and building fences and have added my recommendations here. Building Bamboo Fences by Isao Yoshikawa is a fantastic book. It not only shows you a multitude of designs to choose from it also includes details and plans of how to build the fences along with tying and how to best use tools for the job. Thoroughly recommend this book. Isao Yoshikawa has another book called Bamboo Fences and the two books together will provide you with everything you need to get on with your project which I am absolutely sure you will enjoy.